Team leaders are responsible for creating the conditions that allow great teams to flourish. Such a responsibility is not fulfilled by just learning a formula. It is a dynamic environment with constant movement, requiring re-assessment of expectations and adjustment if actions. However, whilst people alter the underlying principles of teamwork do not. So, to help leaders we share the ‘T.E.A.M.’ model as it enables a plan to form as to how to support a group to work at a higher level together; it stands for Team, Energy, Attitude and Motivation. 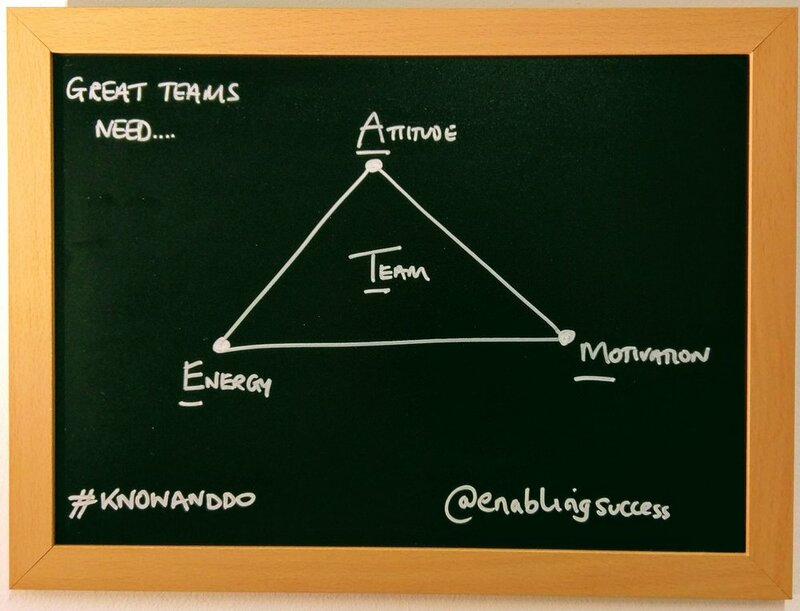 The approach states that a great team will appear if the team members have high energy levels, a good attitude and strong motivation. Each characteristic is connected to another, they literally feed off each other acting as catalysts to create a positive or negative effect. The approach is most helpful where a team must work closely together. In such a scenario the physical, mental and emotional state of individuals has a significant influence on those around them. Imagine a marketing company that serves businesses with a full range of expertise, e.g. research, strategy, web design, search engine optimisation, print, brand, etc. To do this there will be a team of people working for the client – they will have a common purpose, complementary but varied skill sets and will need to hold each other to account. Together they will manage a dynamic environment as they deliver the contract, i.e. moving deadlines, changing project specifications, client feedback and budgets. Thus in this scenario the energy, attitude and motivation of everyone in the team matters, in order to navigate the complexity of the work and be a success. Therefore, the team leader needs to identify the individual motivation of each member. For instance, a visually motivated designer might see high quality very differently to a web coder or market researcher. Thus, the collective motivation - how the team performs for the client - must be clear (and strong) enough to hold the individual motives together. Next, attitude is crucial when delivering a service. How something is done, i.e. the way someone looks at others or the tone of voice, can communicate much more than what is done. A leader can set attitude by example but it is also necessary to do so through explicit instruction, i.e. knowing, sharing and praising the demonstration by team members of the agreed Values. Finally, there is energy; or more specifically appropriate energy. Here a leader needs to assess how the environment, the tasks and the culture all fosters an excitement at working together or a desire to be ready, willing and able to work with others. Team’s usually face a challenge at some point and sufficient energy to find and fulfil a solution is vital. Be unafraid to revise their approach (i.e. learn and adapt) to maintain success. Do your team members understand the overall vision? How much say will the team have in setting targets? How successful has the team been before? How well is the team being led? Does the team have the capacity to achieve the targets? Is the team highly motivated for the tasks? How will the team be empowered to achieve results? How free are the team members to choose their attitude to the tasks? Can the team interpret/influence what the targets are? Does the team have the right collective attitude? How many risks are the team willing/ allowed to take? Does the team fear failure? How long has the team been together? The role of a leader can be isolating as you need to find ways to stay motivated, keep your attitude focused and your energy high. This is where Know+Do can help. Our coaches and trainers focus on creating clarity for our clients and enabling them to define success. If you want ideas to develop inspire your team/s, contact us on 0161 2804567 / info@knowanddo.com to find out how we could help.